Robbie Tilton's Natural Wood and Moss Covered Keyboard | TonerGreen - Eco-Friendly Toners from the U.S. Still remember the Bamboo Keyboard and Optical Mouse we featured last Monday, well I will end the week exactly with a similar topic but this time around, I'm going to introduce you to a moss-covered wooden keyboard. The concept, although may seem quirky, is indeed amazing and something you will not usually see everyday. The idea was all from Robbie Tilton who decided to put life into a normal wooden wireless keyboard. With such questions, the concept was formed into his mind and he started incorporating his ideas on a basic wireless Apple keyboard. According to Inhabitat.com, "The body is formed from two sheets of wood using a laser cutter directed by a CAD file. The top piece was molded using hot water and clamped into place. The electronic components were added back to the housing once the body was dry. 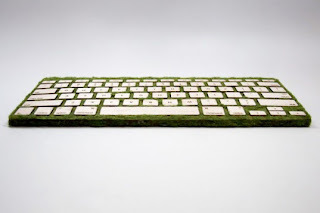 Initially, Tilton wanted to use a paint the moss on the top of the keyboard to allow it grow, but due to time constraints and difficulty finding moss in New York City, he went ahead and used fake turf to demonstrate the concept." 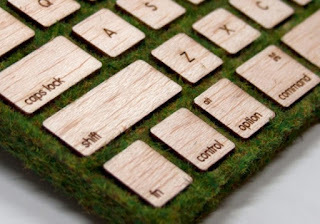 "I chose to create a computer keyboard made of wood and moss. I was passionate about creating this because I feel the aesthetic of modern technological objects are cold and lifeless," Tilton described his work. "Surrounded with tech gadgets made of glass, metals, and plastics – I believe that as a society – we are constantly removing ourselves from nature and have drawn ourselves into a motif of objects that are visually very clean, but also visually bland and tactilely inept. What if our technology lived and breathed? If it required us to water it at night in order to allow it to bloom? If it were both visually and tactilely stimulating would user interactions change and would their relationship toward the object change?" 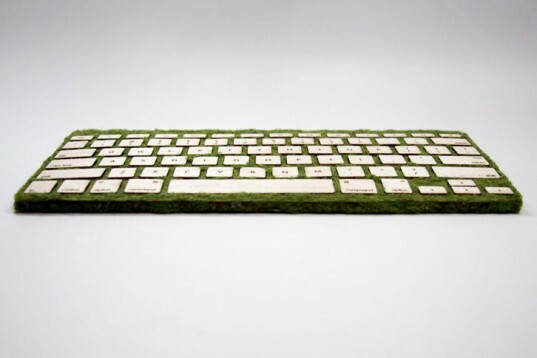 This Natural Keyboard is originally created as an assignment for a course in Digital Fabrication Tilton was taking at Tisch School of the Arts, NYU, and is currently not for sale. How amazing it is that people like Tilton himself are still concern for the wellness of our natural environment in accordance to the development of nature. TonerGreen is one of the eco-conscious online retailers that provides remanufactured toner cartridges and ink cartridges that contribute to energy conservation, sustainability, and environmental responsibility.